It is hot! Phew, must be 38 degrees at least, we have taken to staying indoors wherever possible and only venturing out after 4pm. Mad dogs and Englishmen is quite true, but not in our case. In fact this is probably the only time when we would willingly go into someones shop (especially with AC) - just to get out of the heat. We have just been on a 'sight seeing tour' with a couple of slightly dodgy individuals (from the hotel) who whisked us around various temples in Varansi (most of which were either closed or wouldn't let us in! ), at which point (when they had finished talking on their respective mobile phones) we asked to be dropped at the market. So now we are sitting in a little internet cafe off a very narrow, dirty, smelly alleyway and writing this blog. On the up side, we are drinking cold Coke and having a fag so there is always a silver lining to any cloud. We spent last night searching high and low for the Ghats - and at this moment we still haven't found them, there are so many winding streets with no street names its almost impossible to navigate your way around. Tomorrow morning we have a 5.30 start and are taking a boat trip up (or down) the Ganges, we are hoping that we don't see any dead bodies. 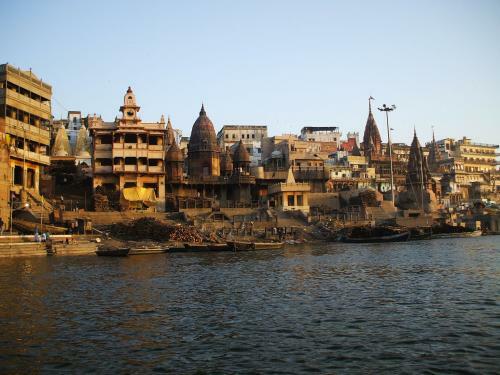 Varanasi is a particularly 'holy' place with over 80 Ghats, (a Ghat is a series of steps leading to the edge of the river), and they tend to do everything at the Ghats, from washing their clothes, themselves or their buffaloes to burning their dead, to name but a few. Most of the time they use the Ghats for praying and as the Ganges is a sacred river there are quite a lot of people here. 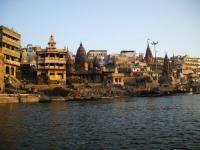 According to various reports approx 60,000 people per day come to the Ghats for various different reasons. However the water is so contaminated that it is actually septic (no dissolved oxygen). Needless to say we won't be bathing in it. Floating on a boat is about as close as we are going to get. Thats about all from Varanasi except to say - if you are ever at Agra Fort train station and you are sitting in the Upper Class waiting room - don't talk to the bloke in charge, it will cost you an arm and a leg and the tea wasn't that good - enough said.